Hey hey they're the Monkees!! This page of my site is dedicated to the people from one of THE best shows in the history of TV, The Monkees. The Monkees TV Show premiered on NBC in September 1966 presenting a wacky comedy show about a 4 piece long haired rock band. It was patterned after a movie, as many TV shows are, called "A Hard Days Night" starring The Beatles. The 4 actors recruited for the show had all performed musically prior to the show, and they used their real names for the characters. Music for them to "romp" to had been created shortly before the show first aired by Don Kirschner, with the actors providing primarily vocals. The album "The Monkees", released to promote the TV show, became a chart topper with the song "Last Train To Clarksville" even before the show had aired, causing the unexpected reversal of the TV show promoting the record. The overwhelming success of the music demanded that this "band" perform live, so the actors rehearsed the music and toured the US in December, playing all of the music themselves. The group was surprised to see the release of their second album, imaginatively titled "More of The Monkees" show up in stores without their input, and go on to be the number 1 album of 1967. The actors demanded and received control of their musical product, as they were being reviled by the musical community for not playing on their records. They went on that year to create the album "Headquarters", the favorite of many fans today, playing all of the music themselves. At this point they began to change the musical sound as well as the tone of the TV show, and the project ran out of steam by the end of the second TV season, and ceased production. Without the TV show for promotion, and with no friends in the music industry because of their "easy fame", the group went their seperate ways. In 1986, MTV ran 24 hours of Monkees TV episodes in a special called "Pleasant Valley Sunday", and revived the 20 year old band, causing a reunion record and tour (minus one notable member)[Mike], to great success until 1989, when they received a star on the Hollywood Walk of Fame before breaking up again. Today, the music of the group lives on through CD re-issues by Rhino, and the issuing of the entire TV series on Video. The Monkees phenomena remains a major event of 60's pop culture. Many argue that it began the idea of music video as promotion, and the marketing of TV show products to pre-teen audiences, as well as opening the door to multi-media. Some still revile the music of the Monkees as "manufactured", others remember it as a fond memory of their childhood. The Monkees were a real working band in every sense of the word, and provided quality music and comedy in a format that had never been tried before, and were wildly successful at it. " 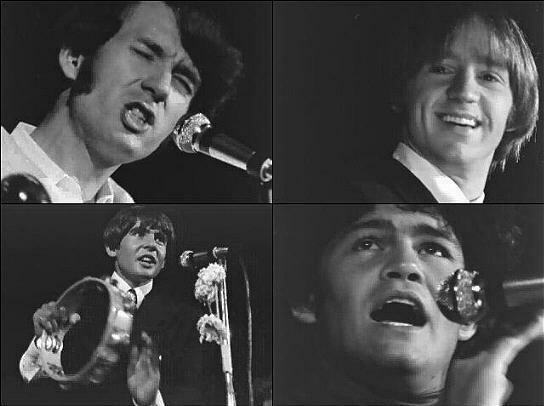 The Monkees [now just Davy and Micky] recently finished a tour, and are going their seperate ways for a while. Micky has a part in the musical, "Aida" and is touring the USA with that, while Davy has some solo concerts to do!